Hey Love: Finds Under $40! Lace! Hey babes! 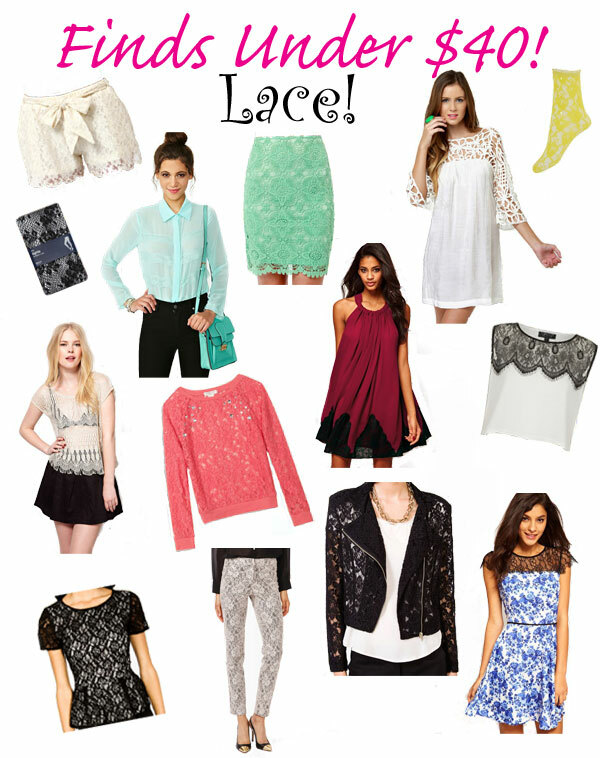 Welcome to the weekend and this week's edition of Finds Under $40: Lace!! Lace pieces are great for this time of year. A great lace top can be worn under a leather jacket or blazer. Or you can add a cute lacy sock to your sandals so you can wear them out while it's still chilly---for a great little pop of color or accent. Lace makes for a great transition piece and is easy to dress up or down. Check out my finds below! I'm really diggin' the Moto Jacket and the Blue Floral Dress! What piece is your fave? Love the lace pants! Soo cute!!! Just bought a fabulous lace blouse at Express for $20 with their 50% off 3 hour sale the other day. oooh i'm a big fan of lace. i really like that mint skirt and the pink sweater - both so lovely. I like it to wear lace, it makes every outfit in an easy way very special. And your selection is great! I;m lusting on the mint skirt! Super lovely! Great picks! I like the mint skirt and the lace tank best. They're all lovely pieces, though! Glad to know I'm not the only one obsessing over lace right now!! Yay I love lace, just bought a lace top over the weekend. I especially love that jacket! That lacy green skirt is SO pretty...great finds! Great roundup. I love that white lace dress... might just have to seek it out asap! I love lace!!! Either of the pretty Asos To Love Kuvaa Lace Fringe Top or the lovely Forever 21 Floral Lace Peplum Top would look lovely paired with the Lulu*s Laced Night on Earth Mint Pencil SkirtLove it! ( a nice choice for Saint Patrick's Day! The Blue ASOS Skater Dress With Lace Top In Floral Print is pretty too. I am really into lace! Especially balck lace. I think its so chic!! I want that lace skirt. Gorgeous, I don't know how much shipping they would take.